Being able to monitor data in an office building and use models to predict events such as room occupancy adds to the understanding and transparency of the processes of the buildings’ energy consumption and the overall behaviour of its occupants. Have you ever accidently left the lights on in the bedroom or left heating on when you are going away for a week? Most of us know that this waste of energy is not only harmful to the environment but also to your wallet. But in comparison with the energy waste that goes on in commercial buildings, such as larger office buildings, the light we forgot in the bedroom is nothing. Office buildings are often being run highly inefficiently and there’s a lack of transparency on how rooms in the building are being used. That leads to empty rooms being heated, and lit throughout the day. In order to tackle these problems we set out to build a prototype to monitor and analyse data in an office space at Munich Airport (MUC), Germany. This prototype eventually lead to founding WATTx’s first venture Snuk. We had access to 4000m2 office space at the airport, spread across two floors. We installed over 200 sensors in 36 rooms and recorded data for a period of 3 months. The sensors recorded temperature, humidity, lightning, luminosity and motion data. With the data at hand, our Data Science team set out to explore it, identify patterns and anomalies, with the goal of quantifying benefits and energy savings, and ways in which to use it to optimise processes in the office building. We used the data from temperature sensors to find unusual patterns patterns that pointed to inefficiencies of the heating systems of the building. 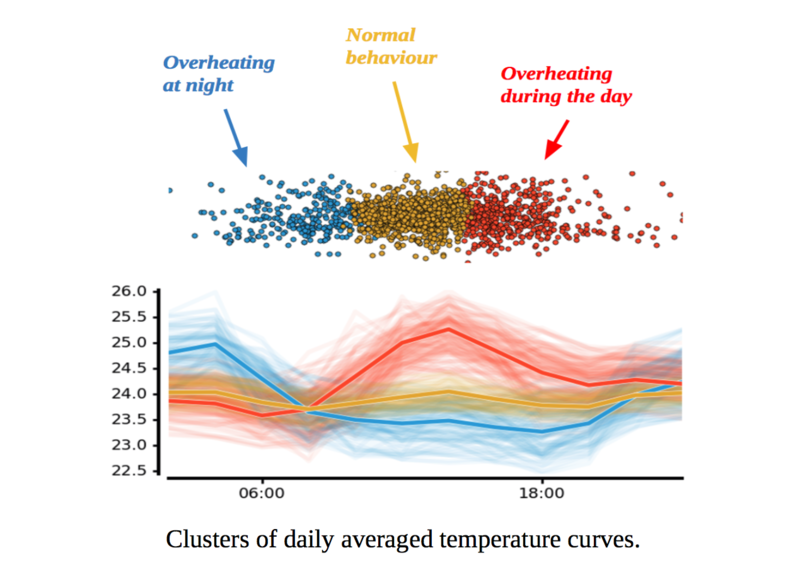 To find these patterns, we used unsupervised machine learning techniques in order to cluster daily temperature curves into distinct categories and spot abnormal behaviour. Below you can see three clusters of daily averaged temperature curves from rooms that we were able to identify. These rooms were overheating during the day and night and indicate a suboptimal usage of the building’s HVAC system leading to wasted energy. Optimising the heating behaviour in those rooms would lead to up to 18% reductions in energy consumption. Inspecting the causes of these abnormal temperature patterns, we were able to identify a few rooms in which the radiators were actually running at night during the summer time. The cooling system had to compensate for this during the day, increasing the energy waste even more. Finally, by applying anomaly detection to the temperature curves, we identified that a control unit of the cooling system was broken. Motion and lightning sensors give insight into when a room is occupied and how it is used. 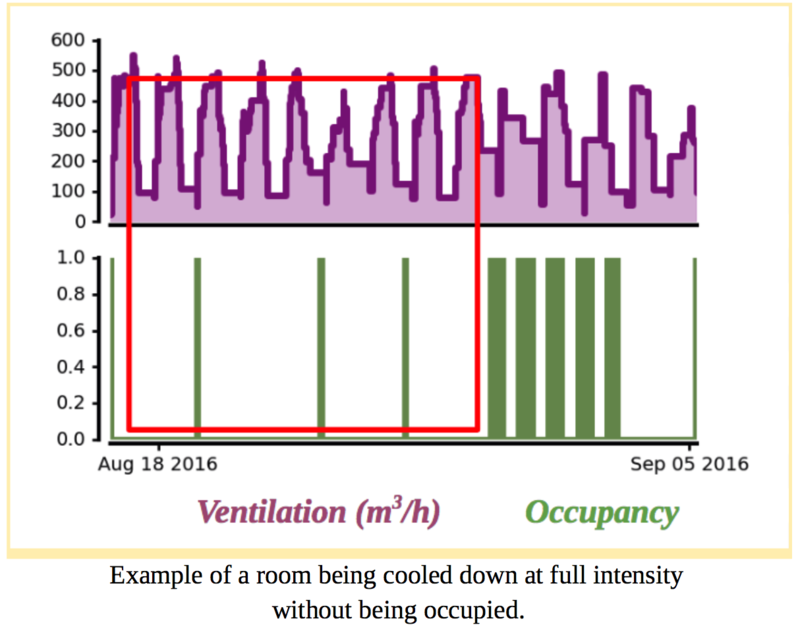 By analysing room occupancy and comparing these data to the ventilation system of the building we were able to detect periods of time in which rooms were being cooled down at full intensity over the period of several weeks without a person ever being present in the room. By optimising this behaviour, CO2 emission can be drastically lowered, and savings potentials in energy consumption for ventilation systems can be as high as 30%. During a working day, it happens that people will be too forgetful, stressed, or distracted to turn the lights of when leaving a room.And so it happens that lights are left on in rooms even though everyone has left. 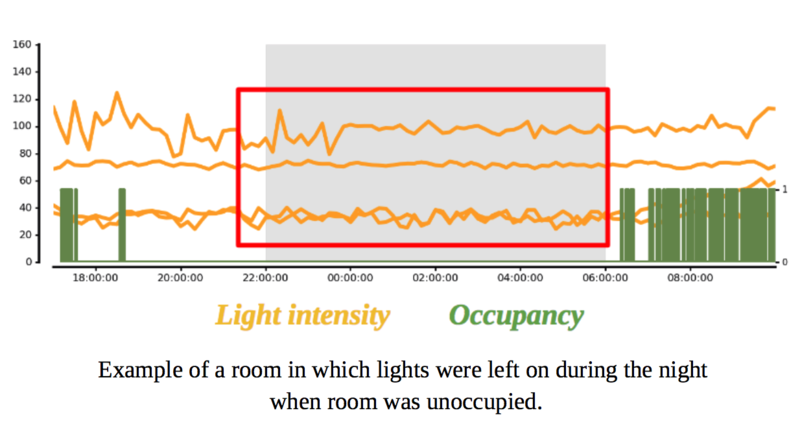 By combining data from motion and luminosity sensors we were able to automatically detect patterns in which lights were left on in unoccupied rooms, especially during the night. In fact, up to 75% of energy consumption for lighting accounts for times in which lighting is not even needed. Again, these are non-negligible saving potentials, especially for large commercial buildings. The data recorded through a system as the one demonstrated above can be used to monitor an office building, identify unusual patterns, and detect anomalies. These insights can be automated and integrated with building management systems in order to react to abnormal events (e.g. turning off the ventilation if a room has been unoccupied for a prolonged period of time). But there’s more. We can go a step further and use these data with machine learning techniques in order to predict certain variables - and that is exactly what we did. We set out to build machine learning models to predict temperature and room occupancy in office rooms. Below you can see exemplary plots illustrating some of our results that compare actual and predicted temperature curves (left) and actual and predicted occupancy (right). Being able to monitor data in an office building and use models to predict events such as room occupancy adds to the understanding and transparency of the processes of the buildings’ energy consumption and the overall behaviour of its occupants. The insights obtained through these data can be used to detect and act upon suboptimal energy consumption. Furthermore, machine learning models can help increase the efficiency of office building even further. Both for the benefit of the environment, as well as high cost savings.